This question was included in my survey of 1,000 Bitcoin users (most of whom responded before the recent price surge), and remains one of the areas poorly examined in media coverage. I don’t buy into the drugs and pizza myth, of a currency first adopted as a means of skirting the law, then primarily used as a means of buying humdrum physical goods. Bitcoin has a distinct set of affordances, very different from traditional currency, so I would expect that to filter through to its use. First, my favourite part of the results. When asked how they have spent BTC (from a set of options), the most frequent response was “Gifts/Donations,” which 36% of users reported doing. Alongside the blockbuster movements of Wikileaks, Anonymous, and Occupy, Bitcoin donations fuel a range of smaller social causes, including net advocacy, hackerspaces, and software projects. Bitcoin also has a rich tipping culture, especially on Reddit. They range in size from friendly tokens to headline-grabbing generosity, but in nearly all cases the gift is anonymous or pseudonymous. Outside Reddit, Bitcoin tipping jars have started to appear, and in certain corners of the blogosphere Bitcoin tipping is more readily available than Flattr. Readers of this blog have gifted 1.5 BTC, or as I like to think of it, 150 MILLION satoshis, for which I am highly grateful. Anthropological study of gift exchange has focused on its role in non-market societies where the rules governing kinship, ownership, and politics overlap. There is a distinction made between gifts (between individuals) and prestations (between larger collectivities). Both exist in abundance in the Bitcoin community, with prestations transferring wealth from the now wealthy early adopters (like BTCBillionaire), to the evangelists, developers, and tentative new users, all of whom ultimately strengthen the wider Bitcoin project. One of the more high profile uses of Bitcoin is the online narcotics market. I think its importance tends to be overstated, but it has given the Bitcoin exchanges the market depth need for early adopters to turn their digital wealth into material wealth, and on that basis has probably accelerated adoption of Bitcoin. Bitcoin affords users relative anonymity, which not only facilitates drugs, it allows people to spend money on anything they don’t want their spouse/parent/local secret agent to see. In fact, while only 11% of users reported buying drugs with BTC, 23% said they have used it for gambling, and 4% reported the ominous sounding “other non-legal goods”. In total, 32% have spent BTC on at least one of these activities, which we might collectively group (without any intention of being judgemental) as “vice”. Does that group overlap with our gifters? Or for that matter, the people who just buy…stuff? How have you spent your bitcoins? 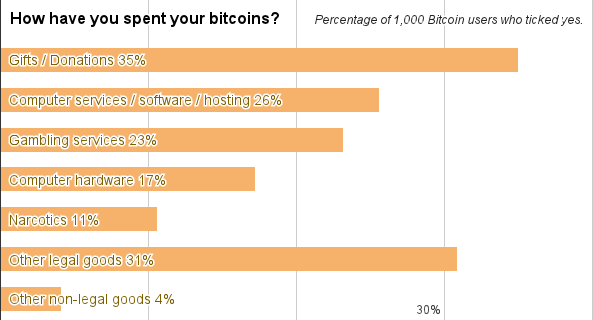 Percentages are based on self-reported use of Bitcoin in terms of number of users. 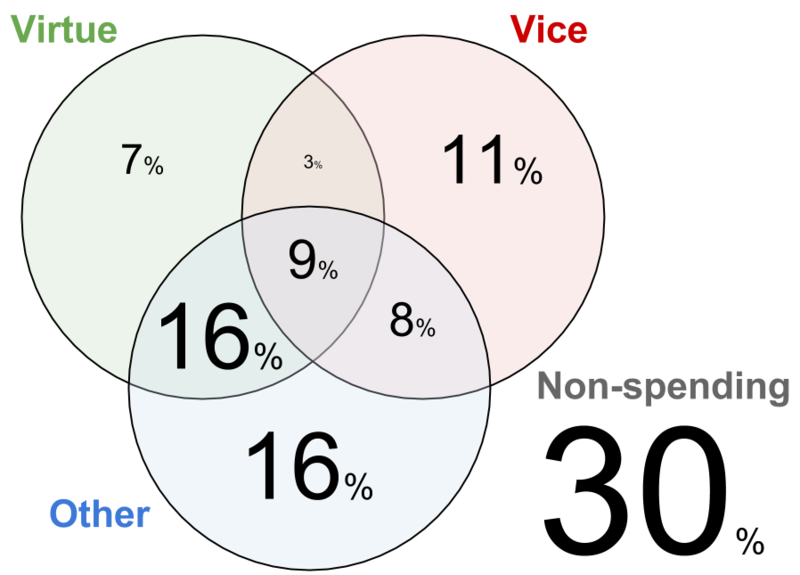 “Virtue” refers to gifts and donations, “Vice” refers to gambling, narcotics, and other non-legal goods, “Other” refers to computer services, computer hardware, and other legal goods. There is a heavy overlap between the gifters (“Virtue”) and the users who choose to use Bitcoin in situations where they could probably use traditional currency (“Other”), and both contingents are likely invested emotionally in the project. Meanwhile the users who need Bitcoin’s anonymity (to secretly treat themselves to some “Vice”) are a distinct group, with relatively little overlap. They are especially distinct from the gifters. The reason I say I don’t buy into the drugs and pizza myth is because both are physical goods, and I think Bitcoin’s greatest advantage over traditional currency is for transactions where no physical interaction between buyer and seller needs to take place. If you order a pizza, at some point the delivery guy has to knock on the door, and there is zero advantage to prepaying in Bitcoin instead of paying cash on delivery. In fact, if you’ve ever had a late or incorrect pizza delivery, you’ll know there are huge DISadvantages to prepaying by Bitcoin. Most of what I spend my money on involves no such “delivery” (rent, tax, insurance) or the delivery needs little interaction with the seller (electricity, phone, software, music, donations). For all these things, Bitcoin offers an advantage. For anything more physical than that, be it pizza or alpaca socks, the advantages are severely diluted, or non-existent. Does the data bear this out? 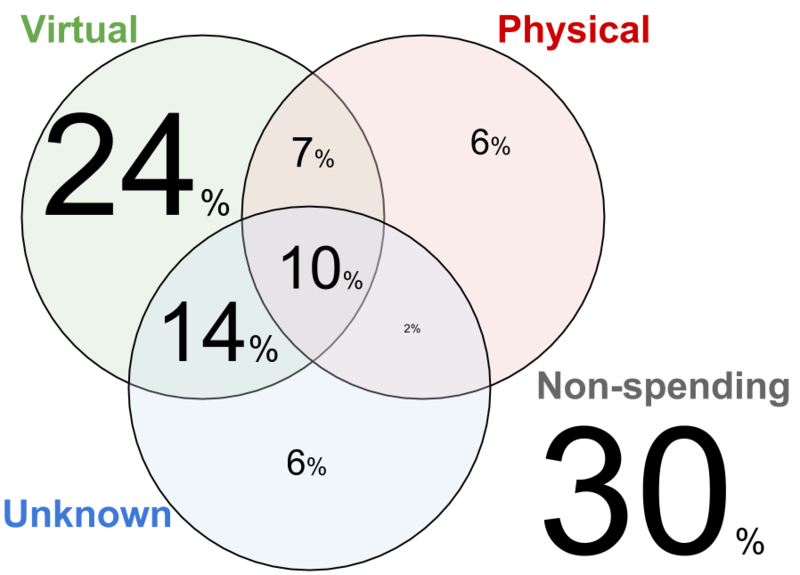 Percentages are based on self-reported use of Bitcoin in terms of number of users. “Virtual” refers to gifts and donations, gambling, and software, “Physical” refers to hardware and narcotics, “Unknown” refers to other legal and non-legal goods. I’m not saying people don’t buy physical goods with Bitcoin, there’s a whole set of interesting reasons why someone might choose to buy a pizza with Bitcoin, and they’re worth exploring. I’m just saying its electronic nature affords it great advantages for virtual goods, and that’s where most people use it, and that’s where the focus of any study of Bitcoin should be. The non-spending contingent falls on wide spectrum from the profiteering to the pensioneering. As shown in the graphs, 30% of users in the survey did not report spending BTC on anything, so we could say with some confidence that many view it primarily as an investment rather than a means of exchange. In fact, 60% of respondents described themselves as a Bitcoin “Investor”, outdone only by the 78% who self-identify as a Bitcoin “User”. Behind these crude taxonomies there is a really rich variety of activity taking place with Bitcoin. At the risk of falling into the trap of evidence by anecdote, here is a selection of other uses mentioned in responses in the survey. I pay my kids allowance in BTC to give them an education in currency exchange, trading, and saving. It’s nice for just passing money around between friends. Great android integration. I organised a group holiday and one of the attendees paid me in bitcoins after I said (mostly as a joke) that I would accept them. I like buying food with BTC. George’s Famous Baklava for example. paid for an ayahuasca retreat in Peru, paying for accommodation with an airbnb in LA, bought some beautiful hand made jewellery as well. I essentially buy comments in my blog. And some bear no comment. I actually bought my first bitcoins after discovering that I could use them to buy a lethal amount of barbiturates on The Silk Road, planning my suicide. I have yet to purchase anything from there and most likely won’t but having that option gives me peace of mind. Harddrives, t-shirts, hosting, advertising, games, Casascius coins/gold bar, graphic design and a hoodie. So far just a bunch of honey. In anthropology (and anything else really) it’s always good to state your own relationship to the material discussed, to give the reader an indication of what biases are in play. I have used BTC to make donations to tech-related causes, to pay for this domain, tip on Reddit, and give to friends who wanted to play around with them. I call gambling a “vice” but I have been known to play a bit of poker. I have about 1 BTC to my name. Pingback: Game over, Bitcoin ! À quand des monnaies virtuelles au service de l’humain ? Pingback: The Rise of the Cryptocurrency Gift Economy – CoinDesk | Bitcoin Mining!